Editor's note: This viewpoint is part of an ongoing debate about how unions should deal with free riders. Check out previous installments here. In the aftermath of the Janus decision, I’ve talked to members of my local, AFSCME 3800, who are mad at non-members. They wonder why they have to pay dues and pick up the slack for co-workers who are paying nothing. Wouldn’t it be better, they argue, if we just focused on the needs of members, and could isolate or ostracize non-members? If the contract was a privilege that only covered members? If we could make clear that non-members pay a real material price? This is the argument that longtime transit union activist Steve Downs and others have made in a recent debate in the pages of Labor Notes. There’s a logic to it. But we can’t fall into this trap. Our strength comes from our solidarity. The whole point of Janus and the many court cases coming down the pipeline is to destroy our collective power and identity by making unions about individual decisions. Billionaire-backed anti-union groups want us arguing over who’s paying for what, rather than fighting the boss. Getting rid of exclusive representation and the duty of fair representation just plays into their hands. Our fights should be for a better quality of life for all workers and communities, where nobody is just scraping by. I’m the president of a local of 1,500 clerical workers at the University of Minnesota. Only 5,000 of the 19,000 workers at the university are unionized. Many workers here have a higher-ed version of Stockholm Syndrome—they think that the boss is looking out for their best interests. But in reality, what the unions win in contract negotiations affects all employees, and that’s how we frame most of our fights. For example, all employees share the same health insurance that has had zero cost increases for employees over the past four years. Large numbers of unionized and non-unionized staff recognize that’s because of our union’s contract fights. We were also able to win six weeks’ paid parental leave for birth mothers two years ago, and to expand that to all parents in this round of bargaining. Our win resulted in non-union workers, too, getting paid parental leave. We could be mad that some workers made the same gains without being a part of our fight. Or we could use the fact that we won parental leave and no insurance increases as a starting point to encourage our non-union co-workers to unionize. We’ve made some amazing gains in bargaining—but we know that if more than 25 percent of our workforce was unionized, we could win even more. Treating the union as an exclusive club where we dole out special privileges will not make people want to join us. History shows that what will convince workers to stick with their union—or join a union—is building collective fights that make gains for us all. The solution is to build the fight, not to hunker down. It is to expand the bonds of solidarity, not narrow them. Instead of looking for every other alternative method, we should focus on the union-building tactics that history has proven are successful: workplace action, strikes, and solidarity. And we should be fighting for the interests of all workers, rather than being narrowly interested in only one workplace or segment of workers. And when the laws restrict our right to strike, or to act in solidarity with other workers, we need to change those laws—or break them. Last month I was a delegate to the AFSCME international convention in Boston, where 5,000 delegates debated the issue of exclusive representation. The panel discussion and floor debate included the perspectives of local and state council leaders from the longtime “right-to-work” states of Florida and Iowa, as well as from the public sector stronghold states of California, Minnesota, and Washington. Following the discussion and debate, delegates passed a resolution, nearly unanimously, defending exclusive bargaining and the duty of fair representation and opposing contract language that benefits members only. Cherrene Horazuk is the president of AFSCME Local 3800 at the University of Minnesota. 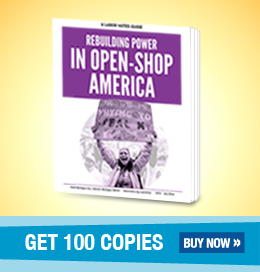 For more on how to build power and membership in a post-Janus or "right-to-work" environment, check out Rebuilding Power in Open-Shop America: A Labor Notes Guide.